Drivers on the highway always see motorcyclists split lanes in traffic, but doing so at 50-60mph is dangerously stupid and causes one unlucky motorist to total their car. if by some chance occurrence you, motorcyclist I did not kill this morning, read this, it would be pretty cool of you to be a decent human being and come forward so that at the very least insurance will pay for me to go to the doctor. A driver swerved to avoid a motorcyclist who was splitting lanes at 50-60 mph on the 805 near the Mesa College exit. Driver missed the biker, but was almost hit by another car. Upon swerving back to avoid collision with another vehicle, the driver lost control of his own car and crashed. The good news is that everyone is alive. The bad news is that the drivers car is totaled and now has no transportation, the driver is injured and can’t pay his insane hospital bills (thanks Obamacare), the driver has no medical insurance because they are between jobs, and the auto insurance can’t cover the bills unless they have the motorcyclists info. They need the bikers info to verify that the accident was indeed caused due to not wanting to hit a biker. I hope the motorcycle person sees this and responds. It would be great to help the car driver get a new vehicle and medical bills paid by his insurance. It’s OK to split lanes at a slow speed, but not at high speeds where someone switching lanes may not see you in their blind spot. 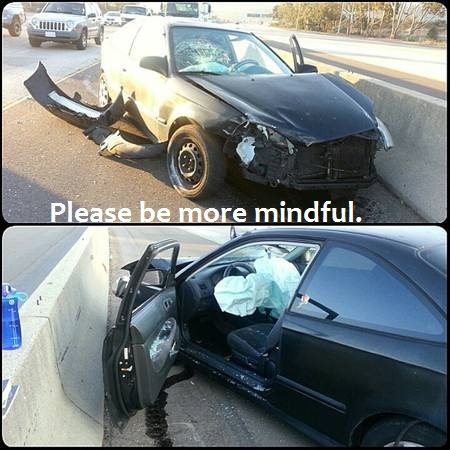 Be mindful and respectful of all drivers. No one owns the road.